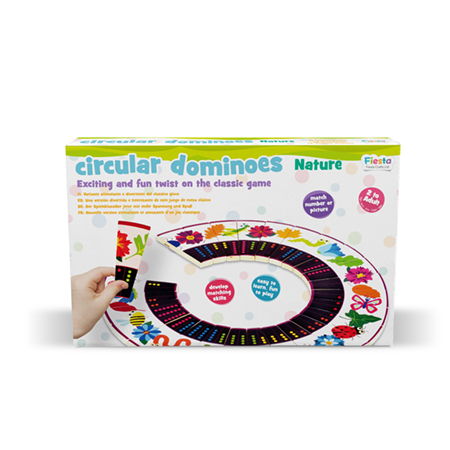 Embrace the curve with these circular dominoes. Featuring a delightful nature-based theme, children will enjoy matching either the pictures, the numbers, or both! There are two games to play. One is like normal dominoes and the other is to complete the circle, and use up all your pieces. With images of insects, plants and leaves, these challenging games can be adapted to suit different abilities. Each player starts with 7 tiles. Players must play a tile that matches either the number or the image to the previously played tile. Make the game harder by only allowing perfect matches  number and image, or make it simpler by allowing any sort of match. If players cant make a match they miss a turn and have to pick up a new tile. The perfect game for 2-4 players, or matching the circle can even be played on your own.